Creating something that’s both depressing and enjoyable isn’t easy. Nobody goes out of their way to be sad. And yet tragedies have been a popular form of entertainment ever since entertainment existed. Shakespeare loved a bit of tragedy, as did the Ancient Greeks. And the trend remains today with the likes of 1984, Requiem for a Dream and pretty much every episode of Game of Thrones. Clearly we get off on depression, otherwise we wouldn’t keep exploring it as an art form. Musically, Radiohead have become renowned for dabbling in dreariness and despair - and people love them for it. Embracing their stereotype for being lugubrious sourpusses, they’ve decided to really push the boat out with this latest album A Moon Shaped Pool, sounding more cheerless than ever before. Low on percussion, the album is slow and brooding, made for intimate listening rather than moving to. Play this at a house party and everyone will leave. All of the songs are strictly downbeat in tone, but excitedly diverse in instrumental flavour, ‘Burn the Witch’ opening the album to a backdrop of intense staccato strings, followed by piano-driven slowburner ‘Daydreaming’ which could be the score to a romantic tearjerker, the kind that has your girlfriend asking ‘are you crying?’ to which you must boldly reply ‘no, I just have something in my eye’. As is Radiohead’s style, the band continue to reinvent themselves. The industrial choppiness of The King of Limbs seems to have been largely abandoned for a more fluid approach, with the exception of driving electronic dirge ‘Ful Stop’. And the band barely pick up a guitar, with the exception of ‘Present Tense’ – and even here it's set to a Latin shuffle, any sign of the band’s rock roots rendered indistinguishable. At this point, the band instrumentally seem to defy all genre labels, concocting their own avant-garde cocktail. 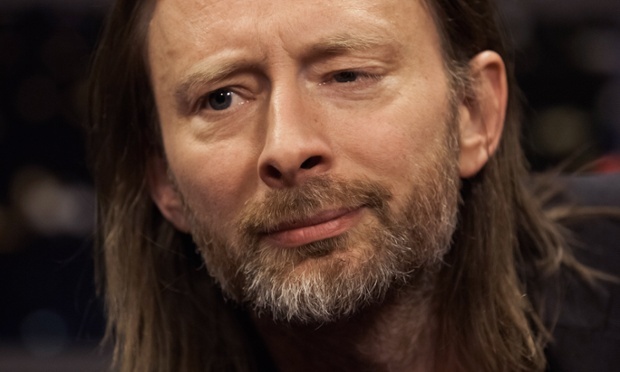 Vocally, things aren’t quite as diverse, Thom Yorke relying largely on a monotone whimpering. That said, he does give one of his most emotionally convincing performances to date. It’s this that separates him from wet blankets like The Weeknd and Lana Del Ray – whilst they seemingly rely on an attention-seeking woe-is-me persona, Thom really feels like he’s venting his negative emotions. When he utters ‘You really messed up everything’ on ‘Ful Stop’, he’s not simply handing out a cliché but instead audibly spilling out his soul. Similar is the line ‘Dreamers/ they’ll never learn’ on pretty piano ballad ‘Daydreaming’, in which he seems barely able to sigh out the line as if the truth of it hurts too much. Admittedly, without much creativity put into the melody of these vocals, they don’t always keep the listener hooked, leaving tracks like ‘Indikit’ to become easy moments to zone out too. Thom could still be emotionally convincing and add some belting here and there like he used to in Radiohead’s early days. The King of Limbs and his recent solo work have both suffered from a similar over-reliance of whimpering, rarely building or ebbing. Many of the songs feel rather directionless as a result – low on hooks and climaxes, both vocally and instrumentally. Take closing tinkling track ‘True Love Waits’ for example. It’s phenomenally touching commenting on the painstaking wait to find true love, but sonically doesn’t go anywhere, trailing off abruptly when it should be the crescendo to the album. Only two tracks on this album really reach a climax, those being opener ‘Burn the Witch’ and length-titled penultimate track ‘Tinker Tailor Soldier Sailor Rich Man Poor Man Beggar Man Thief’. The first ominously breaks into dissonance. The latter slowly builds from Moby-like chords to soaring triumphant strings. A few more epic outros like this, plus more belting to contrast the whimpering, would have made this album a lot more dynamic I feel, however that isn’t to say A Moon Shaped Pool is a labour to listen to. Radiohead may still be short of party anthems, but their tracks remain consistently engaging in their sonic creativity, Thom also keeping a firm tug on those heartstrings. If you’re feeling down life and need someone to relate to when that 2am comedown hits, Radiohead’s melancholia may offer some catharsis. Or make you more depressed. Hopefully, the former.